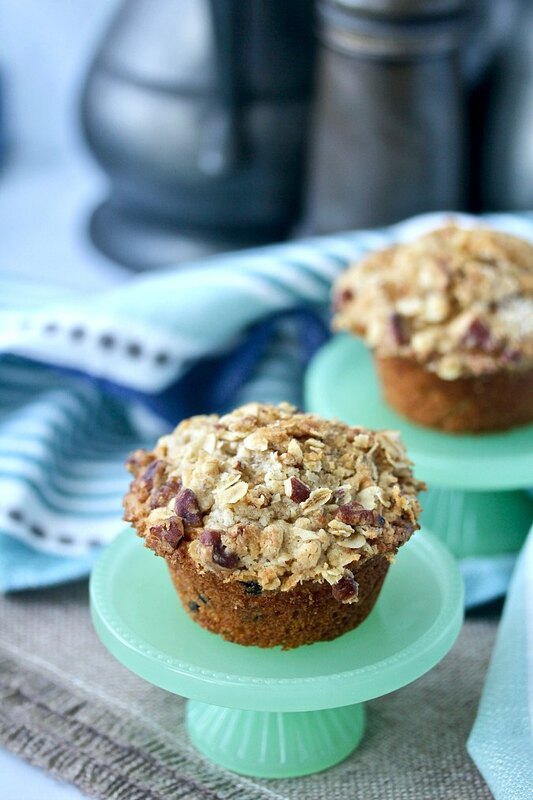 These apple nut oatmeal muffins, made with applesauce and dried blueberries and topped with an oat and pecan streusel, are so moist and tender. 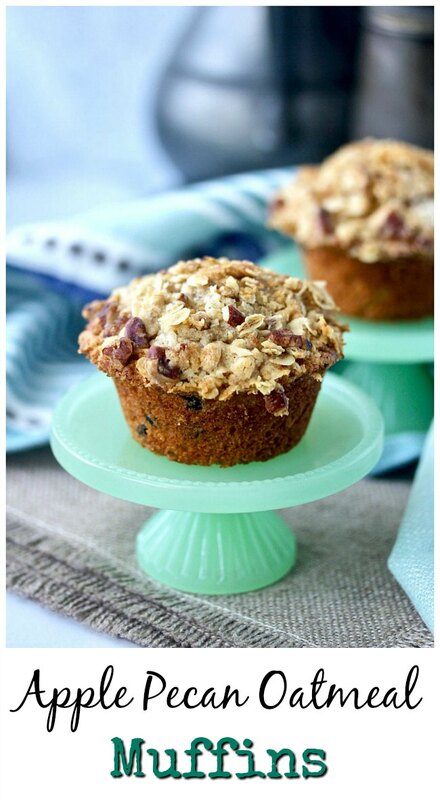 This recipe for Apple Nut Oatmeal Muffins makes just three muffins, perfect for a small household. 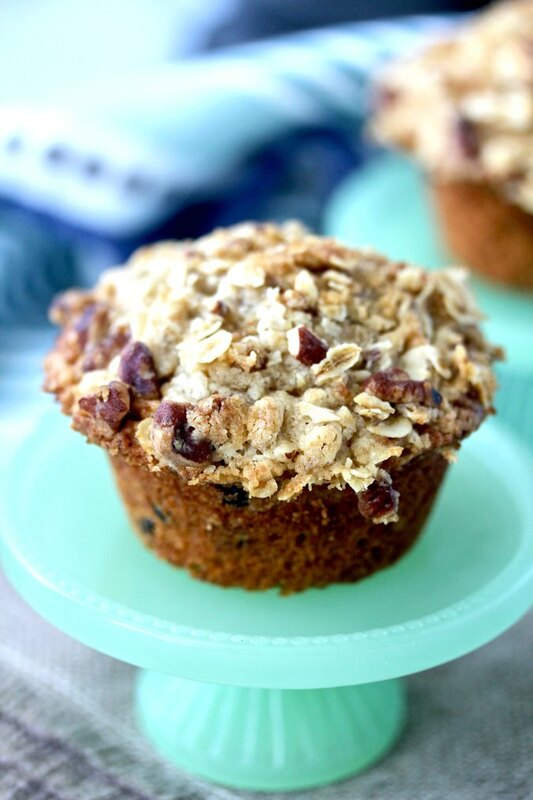 The oatmeal and pecan streusel on these muffins is easy to throw together. The pecans get all toasty while baking, adding a delicious dimension. This recipe calls for dried fruit in the batter. You can add raisins, dried cranberries, currants, or chopped figs or apricots. I'm also thinking that chopped dried apples would be delicious in these muffins. Because dried blueberries are my new favorite dried fruit, I added them to the batter. You can make these oatmeal applesauce muffins with pecans and blueberries using a couple of small bowls. You still use the "muffin method," with the dry ingredients in one bowl and the wet ingredients in the other. I actually used a cereal bowl to mix the wet ingredients. How do you bake a downsized a muffin recipe? 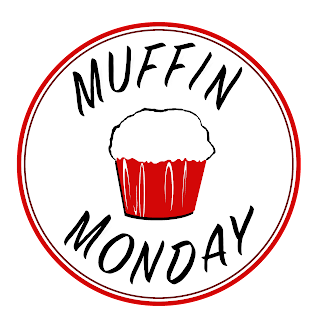 Because most muffin tins have more than three cavities, after filling the tin with the batter, you will need to add some water to the rest of the cavities so that the empty cavities won't burn. This recipe also calls for one medium egg yolk. What is the difference between a medium egg yolk and one large egg yolk? Don't stress, I've got you covered! If you are a baking geek with a scale, the difference is .3 ounces or .86 grams. I'm pretty sure you are safe using a large egg yolk. I whisked a large egg yolk in a small bowl and added it to the liquid ingredients. I'm pretty sure the residue left in the bowl represented the .3 ounce difference. 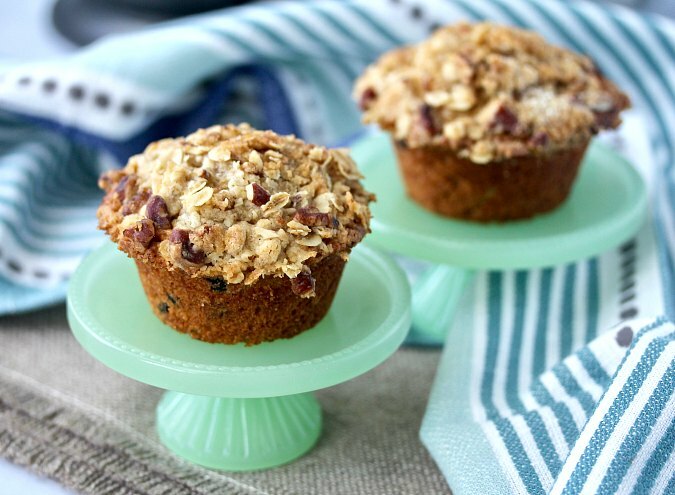 If you love muffins, here are more #MuffinMonday recipes to try! Combine the oats, flour, and brown sugar in a small bowl. Add the butter bits and mix with your hands until pebbly. Add the chopped pecans and toss. Place the bowl in the refrigerator until the batter is ready. Heat the oven to 400 degrees F. with a rack in the center. Oil the bottoms of three cavities of a muffin tin. Brush the top of the muffin tin with oil around the three cavities that you will be using. In a medium bowl, whisk together the flour, oats, brown sugar, baking powder, and salt. Add the dried blueberries and stir. In a small bowl, whisk the applesauce, oil, egg yolk, and vanilla. Pour the liquid ingredients into the dry ingredients and stir until the ingredients are just combined. Divide the batter among the three prepared muffin cavities. Top each with the streusel mixture. Press it lightly into the batter. Fill the rest of the cavities of the muffin tin halfway up with water. Bake the muffins or 18 to 20 minutes, until a toothpick comes out clean. Let the muffins cool in the pan for 5 minutes. Remove the muffins from the pan and cool on a wire rack for another five minutes before serving. This recipe was adapted from Small-Batch Baking by Debby Maugans Nakos. I've tried so many recipes from this book and have loved every one! She has tiny cakes, pies, tarts, small batch recipes for cookies, and other sweet and savory muffins and breads. I simultaneously love the idea of making only 3 muffins *AND* I'm reminded of Kristen Wiig in Bridesmaids going to all the effort to make a single cupcake. I think I'm going with the former--since I like muffins, but I'm sure at some point I'll run out of people to eat the rest of the dozen, downsizing the recipe seems like a terrific idea. Thanks! I'm going to have to google that scene in Bridesmaids! Only three! I am impressed. I must confess that I am a bit concerned with finding homes for all the baked goods I enjoy making when Simon is no longer going to work next month. Small batch baking, especially if it includes deliciousness like your streusel topped muffins, sounds like an elegant solution. Thanks Stacy. I know what you mean. I'll have the same problem when I finally retire!